Enter Kate Raworth, a renegade economist and feminist who proposes a completely different framework for understanding economics and who has now written a marvelous little book, Doughnut Economics, to popularize this whole subject. With luck, this book will shake economists out of their inadequate models and move them toward different and more relevant models. 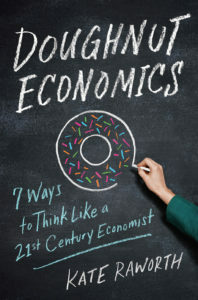 The title Doughnut Economics refers to the central image of the book and has nothing to do with the supply and demand of doughnuts. The concept of envisioning the economy as a doughnut is a stroke of genius and justifies the slightly misleading title. 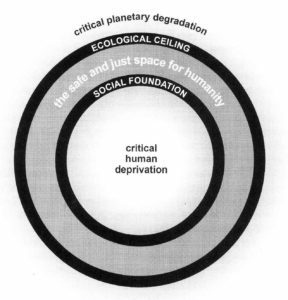 We need to draw one circle to indicate critical planetary boundaries. The economy needs to be smaller than this circle or we will destroy the environment and ourselves with it. Then draw a second circle to indicate basic human needs. The economy needs to be bigger than this circle or people will starve. This indicates the proper goal of economic thought: get into the doughnut. The economy needs to be big enough to support everyone, but small enough not to destroy the environment. By altering the goals of economic thought, Raworth has challenged its whole basis. But Raworth is just getting started. She challenges another central assumption of economics, that human beings are always selfish, rational, competitive, and insatiable. If you think about this for more than twenty seconds, you can see that this view is questionable: people are sometimes altruistic, emotional, cooperative, and certainly not always “insatiable.” Unpaid work that supports the household (care work, traditionally called “women’s work”), for example, goes against all the standard economic stereotypes, a cogent feminist point. Can economics accommodate these realities? Raworth proposes to introduce systems thinking into economics. If you’ve heard of “positive feedbacks” and “negative feedbacks,” then you may already grasp the basic idea. She refers to the 1972 study The Limits to Growth, a pioneer of this approach, quoting Donella Meadows with approval. Because of the nature of complex systems, our whole social system is now in danger of collapse. Self-reinforcing feedbacks are now making social inequality worse at the same time that environmental degradation is accelerating. Economic systems shouldn’t be allowed to spawn these kinds of self-reinforcing vicious cycles. Rather they should be designed from the outset to be fair in the distribution of wealth, and should be designed from the outset to regenerate nature by using renewable materials and by conserving and recycling. We should aim for a generous economy, not a blindly productive economy. Interestingly, though, she advises us in the final chapter to “be agnostic about growth.” After everything that has been said earlier in the book, this will surprise many readers. Why be coy about this? Isn’t it clear that economic growth is destroying the planet? Raworth’s point, which is itself worthy of further discussion, is that just as we shouldn’t aim for growth, we shouldn’t aim for degrowth either. Rather we should hold our two objectives — don’t overstep planetary boundaries, and also fill basic human needs — as our focus. Our analysis should flow from those objectives, not from a preconception of our conclusion, even though “degrowth” is where we may wind up. There are two small points that I would raise about this book. First, there’s no mention in her book or blog of vegetarianism or veganism. I know, vegetarianism isn’t directly linked to the broader problem of economic theory, but whenever someone comes up with some great ideas to save the environment, I always wonder if they’ve thought about or considered the problem that humans eat almost all of the non-human large animals on the planet. How will “doughnut economics” handle this? Just a question. Second, nowhere in the book can I find her actually mentioning the term “ecological economics.” She’s clearly invoking its ideas and its heroes, such as Herman Daly, Donella Meadows, and Nicholas Georgescu-Roegen, all of whom she quotes or refers to with approval. I’d be interested in hearing a bit more from her about the relationship of her ideas to those of other ecological economists. What is she adding, deleting, or changing? The old economics paradigm has failed, but we need to do more than just rehash its failures; we need something to replace it. Could Raworth’s “21st century economics,” or something very similar to it, be that vehicle? I hope that this well-written book will penetrate economics classes everywhere. In the current state of the world, the revolution cannot arrive too early. Good points – Diet (animal products) has a huge impact on the environment. Failure to address this in the book must be deliberate – likely due to fear of offending carnivores. too bad! I think she might be open to the subject. She doesn’t discuss any “solutions” here in any detail, so there is no discussion of solar and wind power, either. You could easily fit vegetarianism / veganism into her system. As you point out, livestock agriculture is pushing us past several planetary boundaries, and on top of that slaughterhouse work is a prime example of glaring inequality. It is low-paying, repulsive, and dangerous work, with a very high turnover rate, which is primarily done by those with practically no other choice.